No detail is unaccounted for at Destroyer, where the presentation, architecture and ingredients all come together to create this minimalist breakfast and lunch spot in Culver City. 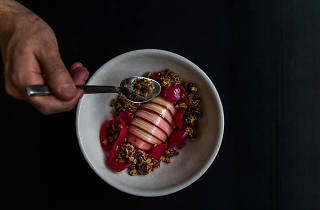 The menu of tiny dishes changes daily and is no stranger to items like raw oatmeal and Icelandic yogurt. 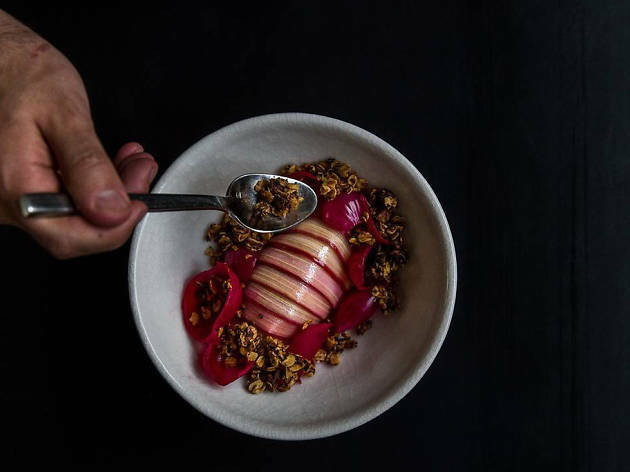 Chef Jordan Kahn (Red Medicine) has an impressive list of restaurants under his belt, and Destroyer is no exception. Destroyer has been on my list for a long time. I have tried Chef Jordan Kahn's delicate food in a couple of fine dining settings, and just loved the minimal concept of this location. It is a bit difficult to get to, since it is located on the westside and only open for breakfast and lunch. I am so happy to have made the trip. The minimalist decor makes the kitchen the star, which is buzzing with almost a dozen chefs. The menu is projected onto the wall. Plating is stunning and I was pleasantly surprised by all the strong flavors. Our group really enjoyed the confit chicken, beef tartare, avocado confit and spice bread. I enjoyed the sense of "digging" as the plates come out piled high with layers hidden underneath. The coffee drinks were made epertly and some of my fellow diners enjoyed a vivid house made blood orange soda. Destroyer makes you feel cool. It's only open during weekdays which makes it harder to get to. When you get there, it feels like you just stepped into a cafe in Stockholm or Copenhagen. The white walls and minimalist wood decor are very calming. The menu is projected on to the wall like a museum installation of some sort. When you get your food, the plating is exquisite. Like they say online, it's so Instagrammable. It's really unfortunate then that the food just tastes okay, maybe even a little monotonous, for how pretty the plating looks. It reminds me of Baroo, but without the confidence in flavors. Maybe I ordered the wrong things, but I really wanted the items to have more flavor.